Disclosure: This is a sponsored post. I received payment for sharing this information, but it in no way influenced my opinion. If you want to try Christmas in July, you’ve come to the right place to learn how to get started. Christmas is my family’s favorite time of the year, and the same is true for many other families! For the children, it’s because Santa Claus comes, but for me, it’s about re-uniting with family members who are usually too busy to come together. This year, you can continue the spirit of joy with a holiday celebration. If you are planning a summer family gathering, give your celebration a Christmas theme. Here are some tips I found helpful on my family’s first attempt at a meaningful Christmas in July. Create invitations for your get together, and make sure to send them out early. Involve the children for a special experience. Have your children at home get involved in creating the invitations. 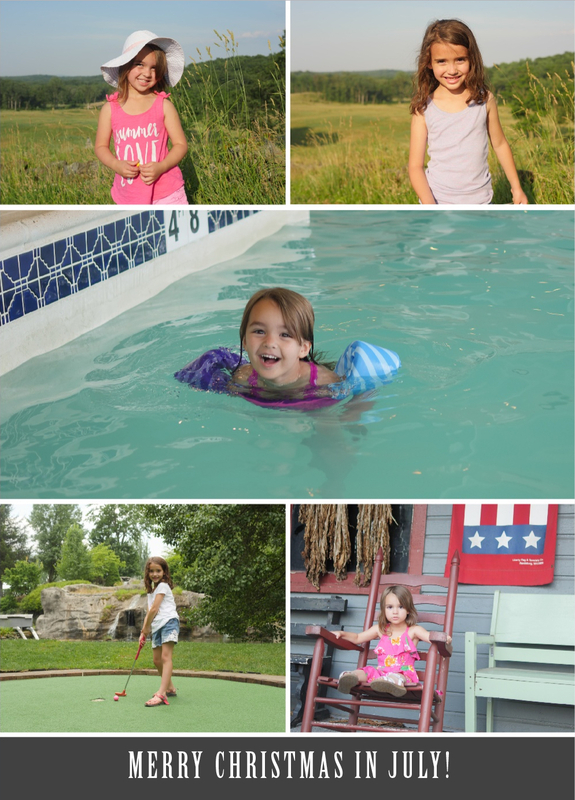 From choosing the photos to use to picking out the designs, your children can enjoy being part of the process. They can even hand write messages on the invitations to their grandparents. If your children don’t live at home any more, you can send them an invitation to remind them of how much you miss them! Children who are studying in college over the summer or traveling abroad will appreciate an invitation to come back home for a special gathering. On your card, include photos of your summer adventures to show what you’ve been up to lately. You can create a special themed Christmas photo, or keep it simple by using photos from your latest beach vacation. Using the website Basic Invite, I created the invitations in this article with photos from our vacations to Gettysburg, Pennsylvania and Chincoteague Island, Virginia. Basic Invite made it easy to plan out the design of my online Christmas cards. Because the layout was highly customizable, my children had many options to choose from as they created the invitations. If you don’t share photos online often, printing invitations with your family photos is an easy way to stay connected. Instead of just looking at photos on your favorite social media website, it’s more meaningful to have a printed card to place out in your home. 2. Decorate and plan for the party. Whether you want a movie party or a pool party, your theme will help decide your decorations and activities. For a movie party, everyone can enjoy watching their favorite Christmas movies. Use a projector and a movie screen to turn your backyard into an open air cinema, or throw the party indoors. If you are throwing a pool party, turn red and white pool noodles into a pool noodle candy cane. You could also turn white balloons into snowballs for a snowball water balloon fight. Since a wonderful part about Christmas is the food, here are some unique ways to offer Christmas favorites. My family loves grandma’s delicious turkey she makes. Instead of a full turkey, make turkey meatballs with a cranberry and barbecue sauce slow cooked in a crock pot. You could also have a cranberry spritzer on the side. Although ham is a traditional Christmas meal, in summertime, everyone loves the grill. Instead of ham, make a Hawaiian honey hamburger with the pineapple and honey that usually comes on a Christmas ham. Flavor the ground beef with cinnamon, nutmeg, honey and paprika for a Christmas-inspired touch. I created my invitations with Basic Invite, a website that I found simple to navigate. You can also choose from almost unlimited colors, and you get instant previews online. When you select a design, you can change the color of each element on the card with over 180 color options. Being able to customize the cards means that you can make it look exactly as you want it – down to the smallest detail. Another advantage of using Basic Invite is that you can create and order custom samples. If you prefer to see how well an invitation will print and check out the paper quality, order a sample before placing your final order. I ordered samples for my Christmas cards this past year, and I liked seeing the prints in person. Some other things that make Basic Invite stand out is that you can choose from over 40 different colors of envelopes. Before someone even opens the invitation, they can see how special it is. Since the envelopes are all peel and seal, you can quickly and securely close them to make mailing them simple. When you’re sending cards, the free address collection service will be helpful. I always have to look up people’s address before mailing cards, and I’ve noticed that it can be quite time consuming! With the address collection service, you can request your addresses with three simple steps. First, share a link. Then, collect the addresses, and finally, get free envelope printing. Make your invitations stand out with the line of gold and silver foil cards. Foil is available in gold, silver, and rose gold. I used a foil card for my family Christmas cards this past year, and it really made my card look extra special. You can also find over 250 Christmas card and holiday card designs to choose from for your celebration! For Christmas in July, Basic Invite is offering 30% off with coupon code: holi30. To learn more about Basic Invite, you can visit their Facebook, Instagram, and Pinterest page. I am one of those people who listens to Christmas music all year long. I am definitely celebrating Christmas in July! I agree that Christmas music is great year round! That is such a fun idea to get people and family together in the summer and the weather is better for traveling. Those invites look great I will have to remember that site. I agree, it’s a really fun idea to bring families together! This is such a cute and creative idea. A perfect way to get everyone together during the summer! Christmas movies in the summer! How fun! The invites are a cute touch. I have done a Christmas in July but want to! Would be great to have the family over for a good dinner and justvenjoy each others company. Such a cute idea! My kids would love this, they are obsessed with Christmas, as am I! How fun! I love Christmas! I can’t wait for it but celebrating in July sounds so fun! This is so cute! I love software programs like this that let me create special invitations! I seriously never celebrate Christmas in July but can definitely appreciate how fun it could be especially with kids! I think any excuse to share a meal with family and friends is worthwhile! Love the invitations! This is the cutest Christmas in July theme. I would definitely do something like this with my son and husband. I love Christmas in July and have been celebrating it for over 20 years! I usually do it alone, though, because my family thinks I am crazy. How fun to celebrate Christmas in July! My grandma would always have us plan “surprise” parties for my grandpa and we had so much fun planning the party and making the decorations. Basic Invite looks like such an awesome service for any party. This is so fun! What great memories. In our family, we have a reunion every year. We used to do Christmas in July and have a gift exchange, tree and everything and it was so much fun! Thanks for sharing your experience with doing a Christmas in July celebration! I love Christmas in July! You guys did it right. I would love to get my kids involved to celebrate. My Husband would laugh. Such a fun idea. The card and invites are really cute. I think it would be a nice treat to open my mailbox and find a Xmas in July party invite or card. This is so cool. Christmas in July, why not? Oh gosh Christmas in July would be so much better than when it’s cold! I have never sent out invitations for a family christmas before. Will have to keep that in mind. So there exists this Basic invite! So great to know. I had been creating personalized invites before but it cost me so much time. I should have known this before to save time. I love this idea. Christmas is such a wonderful time of year, there is no reason we shouldn’t have those great feelings all year long. I might have to steal this idea. We’ve totally celebrated Christmas in July several times! We watch Christmas movies and eat green bean casserole, ham, pie, etc! It’s a lot of fun! So fun!! My family would be so surprised to receive Christmas cards from us in July, but they would love it! With the busyness that comes with the rush during Christmas, I think it’s actually a great idea to prepare your cards as early as July! One less thing to worry about when December rolls in! These designs are just lovely! We actually celebrated Christmas in July YESTERDAY believe it or not! A local pizza place near us has all these Christmas decorations set up and they played carols–it was so fun, and a mental escape from the triple digit heat! That’s so awesome! Thanks for sharing your Christmas in July experience! I love the Basic Invite info! And the address collection idea with a link is perfect for me! I can’t wait to try them. This is such a fun idea! I’m going to share this with my sister to do with my niece! Cute ideas! My daughters would be all over this party idea. We’re currently on a beach vacation and I know they are so bummed to have to be going home tomorrow. Great idea to gather loved ones even if it’s not yet December! Our little family will try to do this. Christmas in July sounds good to me. My birthday is in July too, so how much fun would that be! These are all such cute ideas. It gets me hyped for the real thing. Such a fun idea. It’s also the perfect excuse for getting friends and family together to celebrate the halfway point of the year. This is such a great idea! And I love the idea of sending something to the kids who don’t live at home anymore. My oldest child lives in another city and I know that she would love a special July surprise from us! Pretty cute idea! As a stationer summer can be a pretty slow time outside of weddings! And many clients freak out during the actual holiday season because production can be backed up and some order too late for what they want. This is a good way to avoid that! I LOVE your idea of taking traditional Christmas meals and putting summertime spins on them! It would be so much fun to watch Christmas movies outside while having a Christmas in July feast. We have a family Christmas in July event coming up this next weekend! We’ve rented a water bouncy house with an attendant to make it extra fun for the kiddos (and parents). Love the idea of the nice meaningful invitations. we have never celebrated christmas in july but totally get why it is done for some families and your tips here are great. What a fun idea!! While we’ve never celebrated this way, I love the idea of celebrating Christmas during the Warner months too!! This is so much fun! I know that I have friends that celebrate Christmas in July and there are also tons of sales.